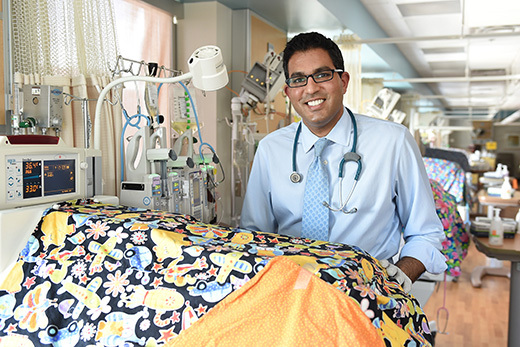 Ravi Patel and colleagues conducted a detailed study on the causes of necrotizing enterocolitis, a leading cause of death in very-low-birth-weight infants. A study from Emory University School of Medicine published in the Journal of the American Medical Association (JAMA) has found that severe anemia, but not red blood cell transfusions (RBC), is associated with an increased risk for a potentially fatal intestinal condition in premature infants. The condition called necrotizing enterocolitis (NEC) is a leading cause of death in very-low-birth-weight (VLBW) infants. The reasons behind the development of NEC are not clear, but there have been conflicting results from studies on two risk factors: RBC transfusions and anemia. Researchers in the current prospective study wanted to determine whether NEC was increased in VLBW infants receiving RBC transfusions compared with those not receiving transfusions. They also examined severe neonatal anemia as an independent risk factor for NEC. An observational study was conducted from January 2010 to February 2014 and included VLBW infants enrolled within five days of birth at three Atlanta level III neonatal intensive care units. The infants were followed for either 90 days, hospital discharge, transfer to a non-study-affiliated hospital, or death. Of 600 infants enrolled, 598 were evaluated. Forty-four of the infants developed NEC. Thirty-two infants died from all causes. A total of 1,430 RBC transfusions were given to 53 percent of infants. The incidence of NEC at week eight in RBC-exposed infants was 9.9 percent and 4.6 percent in RBC-unexposed infants. In multivariable analysis, however, RBC transfusion in a given week was not significantly related to the rate of NEC. Based on Evaluation of 4,565 measurements of hemoglobin (median of seven per infant) the rate of NEC was significantly increased in VLBW infants with severe anemia in a given week relative to infants without severe anemia. “Our results show that severe anemia, rather than red blood cell transfusion, may be an important potential risk factor for necrotizing enterocolitis,” says first author Ravi Mangal Patel, MD, MSc, assistant professor of pediatrics at Emory University School of Medicine and a neonatologist at Children’s Healthcare of Atlanta. The study sites where infants were enrolled included Grady Memorial Hospital, Emory University Hospital Midtown and Northside Hospital. The study was supported by the National Heart, Lung and Blood Institute of the National institutes of Health and the Atlanta Clinical and Translational Science Institute, with additional support from the Emory-Children’s Center for Clinical and Translational Research.